I coloured her with Prismacolour pencils, and I hand drew the window to create a real Christmas scene so that this image really stood out and was the centre of this creation so that I could keep it clean and simple and just frame it. 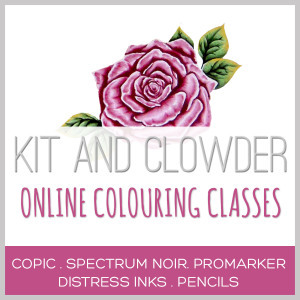 If you would like to learn how to colour like this using pencils go to KitandClowder. 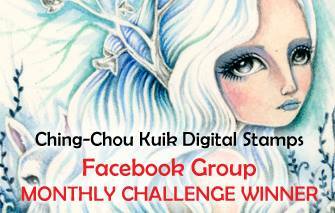 So this weeks challenge was a double birthday challenge to celebrate the second year blogaversary. I decided to create a masculine card, and a feminine gift tag. Make a wish, is a simple a7 card blank, i matted a black background and sprayed it with white gesso and stamped some simple stars. Then die cut some stars, before I printed the rocket digi stamp from Dr-digi www.doctor-digi.com/transport/retro-rocket, I measured the rectangle die I wanted to use to make sure the print out fitted I used a corner punch to round off the corners, after printing I coloured the image with Prismacolour pencils. On the porthole window I used some ranger glossy accents. This cute birthday gift tag was created using an www.aliciabel.com/index.php. 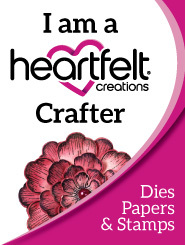 and heartfelt creations garden leaves stamps and dies. Cut a tag shape, mat it with the dark purple paper in the paper pad, take out the page from the paper pad that has ready to cut out images on, I cut out the fence and some presents, print the image and cut out using the oval die, colour the image and stamp a sentiment. stamp cut and colour the leaves and the flower petals shape using your kit then glue together with some stamens. Layer up the tag as in the picture and then add a double glittery bow. You will need, a script type backing paper or scrapbook page in a light colour, a black paper or navy, a Penny Black stamp of a poinsettia, a free stamp set from creative Stamping Magazine (holly leaves), a spellbinder label die black, brown, red, and green ink, finger spongers, micro nail beads, glossy accents, wet glue and foam tabs. stamp out all the leaves you'll need to make a nice ring of holly, stamp out two poinsettias colour every thing while its still in the page, then cut out and shape. Stamp the Poinsettia over the light paper and distress the edges. Distress the edges of the dark paper, then mat and layer as in the pic. using a circle die draw in light pencil and use this a guide to place the holly to create the wreath with a center large enough for the label die cut and stamp the sentiment, using the foam tabs to give height and dimension glue the leaves down and then place the poinsettias in, using the glossy accents drop in round drops in the center of the leaves and tap onto the glue the micro nail beads. Then three drops on the poinsettias. Again use the foam tabs to glue the sentiment in the center, using a spray glue give a light spray to the entire wreath and label and sprinkle with a ultra-fine glitter. This is a gorgeous Christmas and it would make any recipients Christmas a cheerful one. I first measured an oval die to get an estimate of the size of the stamp I'd need to print, I made a blank page page in my Serif program and pasted in three different sized stamps that would fit into many dies. Then I cut out the oval die shape to add dimension to the dig-stamp. Coloured in the digi-stamp using my Prismacolour Pencils, and added some background and snowflakes. The grey card blank is a little squarer than A7 and a tent fold. 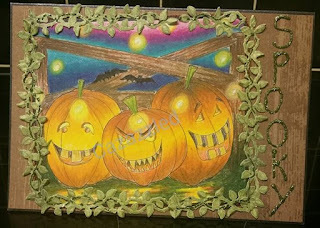 Matted with a background paper textured paper from Winter and co. 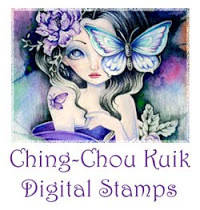 The sentiment stamp is a freebie from Creative Stamping magazine. Then finished off with some snowflake stickers, a glitzy ribbon and bow. So I started with an A5 card blank landscape, printed my image to the desired size, coloured the image with Prsimacolour pencilas, rounded off the corners. Stamped and cut the vines from the above links and glued them all round to give a leafy vine effect like real pumpkins,and then finished of with some glossy accents which i wrote the word Spooky with and sprinkled fine NUYO glitter in olive green. Matted and layered on some wood effect backing paper to finish. A simple but effective card, this image is coloured with Spectrum Noir Pens and Prismacolor pencils, then the webs i used a silver gel pen. The Ornate frame die cut is from Xcut in black and then mounted on purple mirror card. All mounted on to a yellow card blank a5, and the corners rounded off using an xcut corner punch. A quick and easy card, you'll need an A5 card blank, some bakers twine the Heartfelt Creation Everyday Hero's Collection some coloured ink and glossy accents, foam tabs and some black paper for matting. Using a sheet of the 12x12 pad, take the everyday sentiment stamp and stamp in archival ink and emboss in white, then stamp the sentiment again and then colour the watch using some coloured ink to give it a distressed aged look. Then cut it out, mat and layer the backing paper with stamped image on the card blank and wrap the bakers twine around a few times and then tie in a bow. Glue the watch on using the foam tab. to finish off add some glossy accents to the watch where the clock face is positioned. You can find a similar tuturial on the heartfelt website, but i prefer this version. This is an 8x8 card, using some Christmas patterned papers by Trimcraft, the digistamp from our sponsor was a joy to colour with my Prismalcolour on super smooth uncoated card 170gsm. The central backing paper i trimmed down to 6X6 and matted it onto a green paper. I cut the image apart so that I could make it into a shaker card and be a more realistic snow globe, instead of glitter or sequins I used micro nail beads which I picked up in the Poundstore. I have a pad of ready die cut circle and square mats form create and craft tv, I have used a silver one here and it fits perfectly. 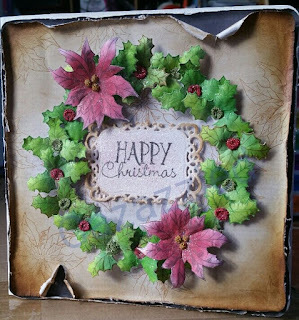 The poinsettia flower is a die set by Sizziz (Susan Tierney Cockborns flower garden), I adore this die set its so intricate and detailed and you can get really stuck in with shaping and colouring and gluing. The tiny poinsettia is a die that came as a free gift with a magazine, then the holly is a die by Marianne Designs. I have used flower soft in the centers of the flowers to add dimension, and little self adhesive gems for berries, finally so read beads on wire add more realistic berries and a touch of Icestickles round the edges and a dusting on the flowers. Finally the sentiment stamp another free gift with a stamping magazine and its a Christmas theme set just released. This stunningly beautiful shadow box was created with a lot of love, the pretty little digi-stamp by our sponsor which I printed out on A4 and trimmed a little down, I coloured the stamp using Prismacolour Pencils. Next it was mounted on black card with a small margin either side for when the frame is mounted. Next measured an orange piece of card exactly the same width as the picture with an extra inch either side which I scored on the ultimate pro, to become a concertina and gives the card its shadow box effect. Using the largest scallop circle die from x-cut and then ran it through the Big-shot Plus. Then lined up the Heartfelt Creations Paper from the Sun Kissed Fleur collection and mounted that. Using red liner tape i glued down the frame at the edges pulling it in a little to create a dome front. Then set about stamping and spritzing the flowers and leaves from the Heartfelt creations collection Sunkissed Fleur, and the garden leaves collection. As this was an embossing challenge making the flowers I used my round ball embossing tools and shaping mat, then the leaves were embossed with embossing powder in a sparkling green colour. Finished off with an over the edge die on the top by Creative Expressions and a sentiment tag from a paper pad adding pearls the flower centers.. 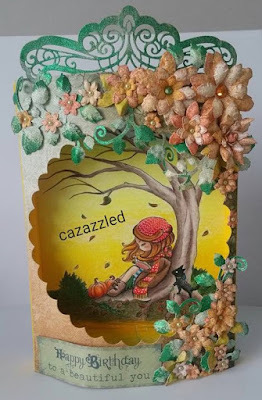 This make is just gorgeous and I am very pleased with how pretty everything is, in certain angles the shadows from the flowers and leaves add to the tree and it all sparkles, very much like Autumn and the dew on the fallen leaves. This was an absolute joy to make, I love making really big cards, they allow me so much room for creativity and the image was a dream to colour! As soon as I saw this image I knew Id be having flying out of brickwork. I just didn't know how I was going to go about it until I found a magazine freebie perfect for this project stashed away while rummaging for a base card. 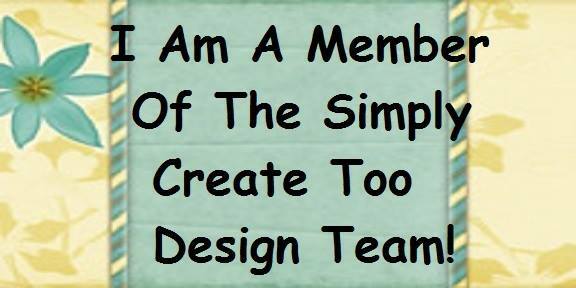 Working with my Serif Craft Artist Programme I resized the image quite large and created the super words and sentiment. This card is a4 and and so the backing paper was a perfect fit apart from some trimming for matting and layering. 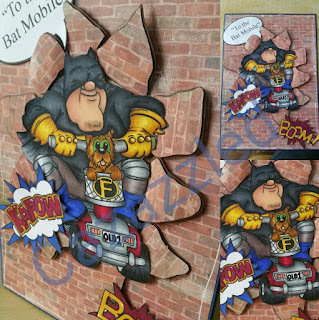 I had two sheets of the backing paper and so decided to cut out some chunky shapes and mat them using 3d tape, "fatman and Bobbin" were placed in the upper center section on double layers of 3d tape to give it height and dimension, adding the flying bricks with my glue gun so it would hold the upwards position I had place them in. Creating Highlights and cast shadows is very tricky when using marker pens and so I like to go in after I have coloured with pens and use my Prismacolours to add that dimension, shade and depth. Although it looks a simple image I spent about 3 hours colouring him on and off during the course of a day, my husband has been ill with Pneumonia and I have to take care of him too.